Oceania is the Most Impressive Hank of Yarn at 1440 Yards of Beautiful! Hi Everyone and Happy 2014! We have lots going on here including lots of new fun yarns to keep you warm!!! New colorways of Ivy Brambles Oceania yarn has arrived. Oceania is back and better than every! 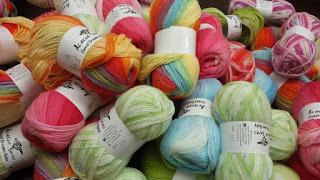 Oceania yarn is a huge hank of hand-dyed yarn that is available for limited time in 1440 yard of super soft Merino wool! Oceania is likely the most impressive skein of yarn you have ever seen. This fine Merino wool is hand dyed and features a boucle twist with a strand of lurex glitter. But what really makes Oceania a knitting aficionados dream-come-true is the over 400g, 1440-yard hank -- enough to knit a whole sweater or large shawl! Oceania knits to 18 sts per 4 inches on a US #6. Hand dyed in the United States by Ivy Brambles in inspirational hand dyed colorways for a limited time only. Come see the beautiful hanks on our website or come by for the real treat! Also, newly stock colors of Berroco Ultra Alpaca - Worsted, Fine and Light and Cascade 220, 220 Superwash, Eco Duo and Heritage Paints! New products arriving weekly to keep you inspired!